International students working in a biomedical engineering lab. When students study abroad, they add a global perspective to their education, and they experience the personal growth that comes from living in a new culture. The College of Engineering has been working to promote and support study abroad experiences and international exchange programs for its students. The college offers six, semester-long study abroad programs, and beginning in the fall, students who study abroad will be able to consult a "road map," a detailed eight semester plan that will allow them to take classes in another country for a semester without delaying graduation. "Engineering students have a rigorous series of classes to complete before they can graduate. Since some upper level classes may not be offered every semester, students who study abroad risk missing their chance to take these required courses. For many students, having a plan that keeps them on track for graduation is a big factor in the decision to study abroad. In addition, semester exchanges are very comparable in cost to a semester on campus," said Bryan Hill, assistant dean for student recruitment and diversity, honors and international programs. Hill worked with the U of A engineering departments and the schools that have study abroad programs with the College of Engineering to create the road maps. One of these programs is an exchange program with Aarhus University in Denmark. In the fall, six engineering students and four students from the Sam M. Walton College of Business will be spending a year at Aarhus, while three Danish students come to the U of A. "Establishing this exchange program has been important to me because I have first-hand experience of how studying abroad can contribute to professional and personal growth and truly shape your life. 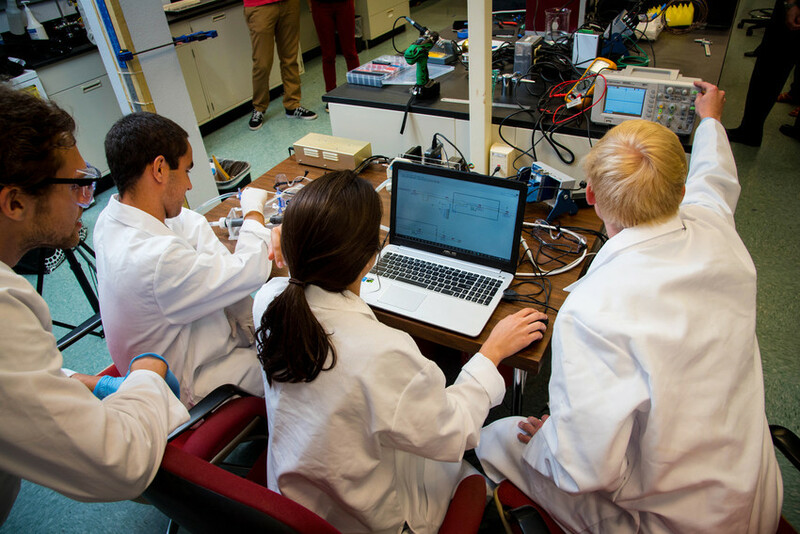 It is very exciting to play a part in providing our students with these unique opportunities," said Morten Jensen, associate professor of biomedical engineering. Jensen, who was a faculty member at Aarhus, was instrumental in establishing the exchange program. In Denmark, students spend their final year in college completing a bachelor's project and a one-semester internship. Students who participate in the exchange program complete both these requirements by working in a U of A engineering lab. Askel Terkelsen came to the U of A through the Aarhus exchange program. He is working in Jensen's lab, developing a new type of heart valve. Terkelsen, who is a mechanical engineering major, was new to both the field of biomedical engineering and the experience of research, and he has learned many new things during his time in the lab. While working on a team along with graduate students, Terkelsen found that his mechanical engineering perspective was helpful when it came to designing medical devices, and he developed a new appreciation for biomedical engineering. "I've always wanted to do something that I know will have an impact and help people," he said. "With the internship, I've found that there's also a lot to do in the world of biomedical engineering that can benefit a lot of people." Terkelsen feels that his study abroad experience has expanded his future career possibilities. Not only is he gaining valuable lab experience, he also knows his international experience will be valuable to future employers. Jensen explained that this is also true for U of A students who travel to Aarhus. "The university and college of engineering there have a strong connection with local industry, so students can make valuable connections on a global level. And almost no matter where you travel to abroad, companies that have presence throughout the world have emerged from there. Denmark, for example, is home to many large and engineering heavy international corporations such as Vestas Wind Systems, LEGO, Novo Nordisk, Maersk, Carlsberg, Danfoss, etc." he said. U of A engineering students also have the opportunity to study abroad at the Politenico di Torino in Torino, Italy. Katie Edwards spent six months in Italy during the spring semester of 2016. She took classes with students from all over the SEC, and got to know students from all over the world. Edwards took advantage of the chance to travel, spending her weekends visiting 17 different countries. "It was kind of scary at first, but definitely worth it," she said about her study abroad experience. "It was an opportunity to grow as a person and become more independent." Students are interested in participating in study abroad can find more information at studyabroad.uark.edu. The team, composed of Nathan Hemby, Olivia Ohlstein and Parker Galligan, beat out 10 teams from across the country to take the top spot in a national video competition. In his final year in the M.F.A. in Theatre Program at the University of Arkansas, Austin Dean Ashford has received a remarkable amount of recognition for his solo plays. A special group of 11 students has been chosen to serve as ambassadors of the Dale Bumpers College of Agricultural, Food and Life Sciences for 2019-20. Two University of Arkansas students — Jordan Maass and Tasha Repella — placed third in a national bioethics essay competition held by the Institute of Biological Engineering in April. Adnan Alrubaye, Dave Dawson and Cassie Franklin are the 2019 award winners of the Collis R. Geren Award for Excellence in Graduate Education.